In the mountains of Fjord Norway you will find some of the deepest snow in Europe, impressive views and skiing possibilities for all levels, from beginners and families, to adventure seeking powder hounds. There are several family-friendly ski resorts offering a wide range of opportunities, from cross-country to alpine skiing and snowboarding. For the more adventurous types, the region is known for its' off-piste areas. The major ski resorts in Fjord Norway can be found in Voss, Myrkdalen, Sirdal, Sogndal, Sognefjord, Strandafjellet and in the Alpepass region. The Alpepass is a lift pass that can be used in nine different lift systems. The resorts offer ski-schools for all levels, ski and equipment rentals and slopes suitable for beginners and advanced skiers alike. You will find various accommodation offers and convenient ski-in/ski-out alternatives perfect for families with small children. Fjord Norway holds long traditions when it comes to food and drink and there are several alternatives to choose from, from fine dining to fast-food. 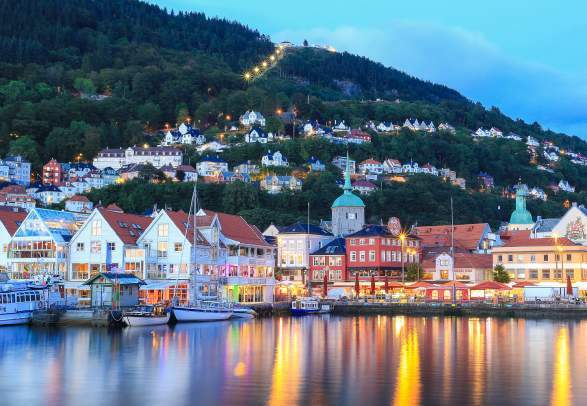 The ski resorts are located just a short distance from idyllic villages and vibrant towns and it is easy to combine your stay in the ski resorts with a fjord cruise on the Nærøyfjord, the Geirangerfjord or the Hjørundfjord, or a city break to ease tired legs with a day away from the slopes. In Fjord Norway you can get your snow fix even during summer. There are two ski resorts located on the glaciers that offer summer skiing, as well as guided glacier hikes and other adventures. Find more inspiration on Fjord Norway&apos;s official website. Relaxing at Stranda ski resort. Powder skiing at Sogn Ski Centre. Voss ski resort has 40 kilometres of well-groomed slopes for all levels and an exciting off-piste area. Here you’ll find ten lifts and 23 trails, two terrain parks, ski cross trail, three children’s areas, groomed cross-country trails, and four restaurants. There is also a ski school, ski rental, and après-ski at the resort, as well as ski-in/ski-out accommodation. Check out their web camera for weather and conditions. Stranda ski resort is located east in the popular “Alps of Sunnmøre” in the western part of Norway. Here you’ll find activities for the entire family: 18 runs with lifts and a gondola, restaurants, children’s park/family area, terrain park, ski school, ski service, and guides. The resort strives to satisfy the needs of every winter enthusiast. Sirdal ski centre at Tjørhomfjellet and Ålsheia brings fun to the whole family. Here you will find nine lifts, two children’s areas where your little ones might run into Snøfte the mascot, two terrain parks and 22 slopes, ski rental, ski-school, cafés, ski jump with airbag landing pad, as well as the possibility for night skiing in floodlit slopes. Hodlekve has a 1200 meter long ski lift, bringing you up about 290 metres. From here you have several slopes, prepered tracks and off-piste possibilities to choose from. You can also take a short hike (approximatly 1,5 hours) to a mountain called Blåfjell, from where you will get a joyable skiing adventure. Sogndal ski centre also offer ski-school and ski rental. The ski lift at Heggmyrane, Hafslo, is one of the longest in the country and will lead to several slopes and various levels of difficulty, including a children’s area, super-G facilities, and nice areas for snowboarding, off-piste skiing and night skiing. The resort also offers equipment rental and a ski school. In addition, there are possibilities for cross-country skiing in groomed trails, some of which are lit up for night skiing. Myrkdalen has more snow than most ski resorts in Europe, which makes the destination very desirable for ski enthusiasts. The resort is located in Voss in Fjord Norway and is a family-friendly ski resort with 22 slopes and 9 lifts, terrain parks, and great off-piste terrain. Check out Myrkdalen’s web cameras for weather and conditions. Voss ski resort has 25 miles of well-groomed slopes for all levels and an exciting off-piste area. Here you’ll find ten lifts and 23 trails, two terrain parks, ski cross trail, three children’s areas, groomed cross-country trails, and four restaurants. There is also a ski school, ski rental, and après-ski at the resort, as well as ski-in/ski-out accommodation. Hodlekve has a 3,940 feet long ski lift, bringing you up about 950 feet. From here you have several slopes, prepared tracks and off-piste possibilities to choose from. You can also take a short hike (approximately 1,5 hours) to a mountain called Blåfjell, from where you will get an enjoyable skiing adventure. Sogndal ski centre also offers ski-school and ski rental. With an Alpepass ski pass in your pocket, you are free to visit and combine nine ski centres in Fjord Norway. The adventure starts between the eternal ice of the Jostedalsbreen glacier, the peaks of the Sunnmøre Alps, and the beautiful Norwegian fjords. Clarion Hotel Air is a first class conference hotel opening on 23 November 2015. One of Bergen's newest and largest hotel with 368 spacious, bright and modern rooms. Thon Hotel Maritim occupies a central position in the heart of Stavanger. Centrally situated on Bryggen between Haakonshallen and St. Mary's Church. 2 minutes walk to the Airport bus. Beautiful hotel next to the theatre in Bergen city center. Breakfast and free wifi included.